Mooie Nel is a new Mulder 55 Explorer built for a client from the Netherlands. Although most Mulder yachts head for the Mediterranean region, she will mainly be cruising in Northern Europe and be berthed close to the builder's yard in Voorschoten, Netherlands. As the first Explorer yacht in the Mulder Shipyard range, Mooie Nel is a landmark project in many respects. The famous Dutch Shipyard created Mooie Nel under its ‘Built by Mulder’ label, which offers clients the opportunity to utilise the expertise and craftsmanship of the shipyard and realise their own design for a dream yacht. Naturally, the design needs to be in line with the character and quality standards applied by the yard. The Mulder 55 Explorer has a round-bilged hull to ensure excellent performance in all weather conditions. Her engine system consists of two John Deere 200hp each, giving a maximum speed of 11 knots and a cruising speed of nine. The white superstructure and grey hull have been combined with various high-gloss varnished teak details and polished stainless steel. Despite its robust character, the 55 Explorer has maintained an elegant appearance. 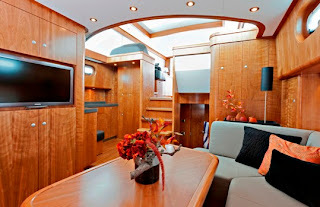 The yacht interior consists of cherry wood with unvarnished teak floors. A unique feature is the floor heating throughout the yacht to ensure a constant temperature throughout. The Mulder 55 Explorer interior layout offers three suites: Two guest cabins amidships and an owner’s stateroom fore. The saloon has a spacious L-shaped sofa and the galley is fully equipped with high-end kitchen appliances. The wheelhouse contains a comfortable L-shaped sofa with great views over the water. A press of the button slides down the automatic screens to blind the wheelhouse windows. Additionally, the wheelhouse has a large electric sliding roof for maximum ventilation and an outdoor feel. The four teak swing doors provide access to the aft deck, which is fitted with a U-shaped sofa with comfortable cushions. Mulder Shipyard is currently working on various other projects such as a new 73 Flybridge, a 98 Flybridge and several of the much appreciated down East lobster boat looking Favorite models.